Undocumented immigrants are expected to make up a larger share of Connecticut’s uninsured population next year, putting new financial pressures on safety-net hospitals that provide emergency care to everyone, state and national health experts predict. The Affordable Care Act (ACA) provides coverage options for legal immigrants, but those in the U.S. illegally cannot apply for Medicaid, even if they are poor, or buy coverage at Access Health CT (the new insurance marketplace), even if they have cash. That means illegal residents without coverage will continue turning to local emergency departments for care at a time when Connecticut hospitals face the loss of millions of dollars in federal and state subsidies to help defray the cost of uncompensated care. “This is a global problem that isn’t going away. This population (of undocumented residents) is not being addressed by any state or federal initiatives. It’s operating under the radar screen,” said William Gedge, senior vice president for payor relations for Yale New Haven Health System, the state’s largest provider of uncompensated care. The system includes Yale-New Haven Hospital, Bridgeport Hospital and Greenwich Hospital. The dilemma sheds light on the uncertain future of the so-called safety-net hospitals in Connecticut and the nation as health care reform unfolds. Often located in urban areas, safety-net hospitals treat a disproportionate number of low-income, uninsured, and otherwise vulnerable populations, including undocumented residents. Federal law requires hospitals to provide emergency care, regardless of a patient’s ability to pay or immigration status. In 2012, Connecticut hospitals spent $233.6 million in uncompensated care, including charity care and bad debt, according to the state Office of Health Care Access. These facilities spent another $868.3 million to cover Medicaid and Medicare reimbursement shortfalls in 2012, reports the Connecticut Hospital Association. 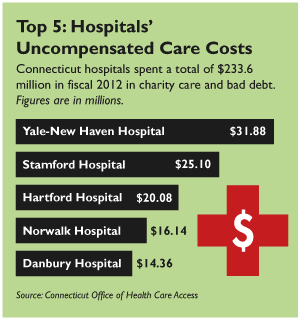 Yale-New Haven spent $31.8 million on uncompensated care (charity and bad debt), followed by Stamford Hospital at $25.1 million. Sharon Hospital spent the least, $1.4 million. Hospital officials expect the budget gaps to widen in 2014 when the health law begins to sharply reduce government subsidies known as “disproportionate share hospital (DSH) payments” on the assumption that more people will be covered by Medicaid or private insurance due to reform. Connecticut hospitals also face a $550 million cut in state funds that previously covered Medicaid expenses. So far, budget cuts have had a “fairly large impact’’ on hospitals, leading to layoffs and cut backs on new hires, patient services, research and technology – while spending millions to cover uncompensated care and government reimbursement shortfalls, said Stephen Frayne, senior vice president for health policy at the Connecticut Hospital Association. “Hospitals face the challenge of some how absorbing theses cuts, while providing top quality care,” he said. Ensuring that Medicaid is “adequately funded” under the program’s expansion effective Jan. 1, 2014 is another concern, he said. Connecticut hospitals spent $504.2 million in 2012 to cover Medicaid reimbursement shortfalls, the first time the amount exceeds half a billion dollars, reports CHA. “All of our five hospitals function as safety-net hospitals. So sadly, we look at the elimination of DSH payments as another cut from the federal government because the additional revenues from some incremental bump in Medicaid enrollment will in no way” close the budget gap, said Dr. Rocco Orlando III, senior vice president and chief medical officer of Hartford HealthCare, which includes Hartford Hospital, The Hospital of Central Connecticut, MidState Medical Center, Windham Hospital and Backus Hospital. Connecticut’s diverse immigrant community comes from many countries including, South America, Mexico, Central America, the Caribbean, Asia, Europe and Africa. Many are here legally, but an estimated 55,000 to 100,000 are undocumented. While the census attempts to count all residents, it does not include a question on immigration status. “There is a misperception that everyone will be covered by the law,’’ said Andrea Rynn, director of public and government relations for Western Connecticut Health Network, which includes Danbury Hospital and New Milford Hospital. “It’s our hope that most people will be covered. But we also recognize that we have a high population of undocumented (residents) who are uninsured in our region. It’s a real issue for our community,’’ she said. Uncompensated care cost Danbury $14.3 million, and New Milford $1.8 million, in fiscal 2012. Leticia Colon, outreach public relations coordinator for Optimus Health Care, worries that hospital budget cuts will leave uninsured patients, including undocumented immigrants, with limited access to the specialized expertise and services only found at hospitals. “What is going to happen to these human beings who cannot afford coverage or do not qualify for any insurance because of their legal status?” asked Colon. Optimus Health Care operates federally funded health clinics in Bridgeport, Stamford and Stratford that serve special populations, including the uninsured, underinsured and undocumented. “We want to be in a position where (undocumented immigrants) can go to the doctor for preventive services, which is key to health care reform,” added Yanil Teron, executive director of the Center for Latino Progress, which has a grant from Access Health to educate and enroll Hispanics in the new coverage options. In extreme cases, undocumented immigrants travel thousand of miles from their native country intent on seeking medical care at an emergency department in the United States. For now, experts expect little change in the near future for undocumented immigrants. Stalled plans to overhaul immigration do not address health insurance and the odds of lawmakers changing the federal law to include unauthorized immigrants are slim. View all hospitals’ uncompensated care costs here.